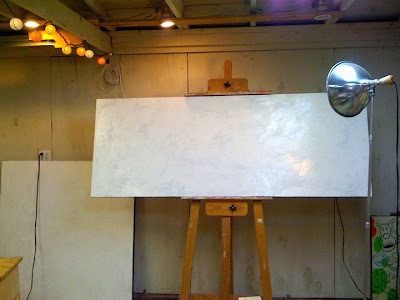 Well, this past weekend I started to prep 2 new large canvases measuring 30X80 inches (on the easel) and 48X48 inches (behind the easel). While many of my new pieces for my upcoming shows will be much smaller than these, I've been itching to work on some larger pieces again too. Prepping these larger surfaces felt great and the thought of doing a large horizontal piece is kind of exciting. Each piece currently has about 4 layers of texture that I built up using 1) a layer of black acrylic, 2) a layer of white acrylic, 3) a layer extra heavy matte gel medium and finally 4) a final layer of white acrylic. Using various palette knives, I keep building up the surface until I get it just the way I want it: thick and smooth! If all goes well, now that it's warmer, there will also be a couple of collaborations happening in the not-so-distant-future. More on that later. I'll be posting progress pics of all my pieces here and on my flickr page. Stay tuned! man! how inspiring is that?! have fun playing on them! and thanks for sharing about your prep process. i'm tuned in here...can't wait to see what comes! I've never worked on anything that big; I don't even know how to prep a canvas... So nice to learn about your process!